For the Arts & Science Undergraduate Society, see Queen's Faculty of Arts and Sciences. AsusTek Computer Inc. (/ˈeɪsuːs/; Chinese: 華碩電腦股份有限公司; pinyin: Huáshuò diànnǎo gǔfèn yǒuxiàn gōngsī; stylised as ASUSTeK or ASUS) is a Taiwan-based multinational computer and phone hardware and electronics company headquartered in Beitou District, Taipei, Taiwan. Its products include desktops, laptops, netbooks, mobile phones, networking equipment, monitors, WIFI routers, projectors, motherboards, graphics cards, optical storage, multimedia products, peripherals, wearables, servers, workstations, and tablet PCs. The company is also an original equipment manufacturer (OEM). Asus is the world's 5th-largest PC vendor by 2017 unit sales. Asus appears in BusinessWeek's "InfoTech 100" and "Asia's Top 10 IT Companies" rankings, and it ranked first in the IT Hardware category of the 2008 Taiwan Top 10 Global Brands survey with a total brand value of $1.3 billion. The company is usually referred to as "Asus" or Huáshuò in Chinese (traditional Chinese: 華碩; simplified Chinese: 华硕, literally "Eminence of/by the Chinese", where "Hua" (華) refers to China.) According to the company website, the name Asus originates from Pegasus, the winged horse of Greek mythology. Only the last four letters of the word were used in order to give the name a high position in alphabetical listings. The company's slogan/tagline was "Rock Solid. Heart Touching", then "Inspiring Innovation. Persistent Perfection." Currently it is "In Search of Incredible." Asus was founded in Taipei in 1989 by T.H. Tung, Ted Hsu, Wayne Hsieh and M.T. Liao, all four having previously worked at Acer as hardware engineers. At this time, Taiwan had yet to establish a leading position in the computer-hardware business. Intel Corporation would supply any new processors to more established companies like IBM first, and Taiwanese companies would have to wait for approximately six months after IBM received their engineering prototypes. According to the legend, the company created a prototype for a motherboard using an Intel 486, but it had to do so without access to the actual processor. When Asus approached Intel to request a processor to test it, Intel itself had a problem with its own 486 motherboard. Asus solved Intel's problem and it turned out that Asus' own motherboard worked correctly without the need for further modification. Since then, Asus was receiving Intel engineering samples ahead of its competitors. In September 2005, Asus released the first PhysX accelerator card. In December 2005, Asus entered the LCD TV market with the TLW32001 model. In January 2006, Asus announced that it would cooperate with Lamborghini to develop the VX laptop series. On 9 March 2006, Asus was confirmed as one of the manufacturers of the first Microsoft Origami models, together with Samsung and Founder Technology. On 8 August 2006, Asus announced a joint venture with Gigabyte Technology. On 5 June 2007, Asus announced the launch of the Eee PC at COMPUTEX Taipei. On 9 September 2007, Asus indicated support for Blu-ray, announcing the release of a BD-ROM/DVD writer PC drive, BC-1205PT. ASUS subsequently released several Blu-ray based notebooks. On 9 December 2008, the Open Handset Alliance announced that Asus had become one of 14 new members of the organization. These "new members will either deploy compatible Android devices, contribute significant code to the Android Open Source Project, or support the ecosystem through products and services that will accelerate the availability of Android-based devices." On 1 June 2010, Asus spun off Pegatron Corp. In October 2010, Asus and Garmin announced that they would be ending their smartphone partnership as a result of Garmin deciding to exit the product category. The two companies had produced six Garmin-ASUS branded smartphones over the prior two years. In December 2010, Asus launched the world's thinnest notebook, the Asus U36, with Intel processor voltage standard (not low voltage) Intel core i3 or i5 with a thickness of only 19 mm. In January 2013, Asus officially ended production of its Eee PC series due to declining sales caused by consumers increasingly switching to tablets and Ultrabooks. Asus has its headquarters in Beitou District, Taipei, Taiwan. As of 2009[update] Asus had manufacturing facilities in Taiwan (Taipei, Luzhu, Nangan, Guishan), mainland China (Suzhou, Chongqing), Mexico (Ciudad Juárez) and the Czech Republic (Ostrava). The Asus Hi-Tech Park, located in Suzhou, covers 540,000 m2 (5,800,000 sq ft). Asus operates around 50 service sites across 32 countries and has over 400 service partners worldwide. Asus' products include 2-in-1s, laptops, tablet computers, desktop computers, smartphones, personal digital assistants (PDAs), servers, computer monitors, motherboards, graphics cards, sound cards, DVD disc drives, computer networking devices, computer cases, computer components and computer cooling systems. One of Asus main lineup is the Vivo lineup consisting of laptops (VivoBooks), All-in-Ones (Vivo AiO), desktops (VivoPC), Stick PCs (VivoStick), Mini PCs (VivoMini), smartwatches (VivoWatch), computer mouse (VivoMouse) and tablets (VivoTab). Most of Asus' smartphones are powered by Intel Atom processors with the exceptions of few Padfone series and some ZenFone 2 models that use Qualcomm Snapdragon, though later phones in the series now either use Qualcomm Snapdragon or Mediatek systems on chip. Discontinued series previously offered by Asus includes the EeeBook Series, K Series, X Series, E Series, Q Series, B Series, V Series, P Series, F Series and A Series. Since its launch in October 2007, the Eee PC netbook has garnered numerous awards, including Forbes Asia's Product of the Year, Stuff Magazine's Gadget of the Year and Computer of the Year, NBC.com's Best Travel Gadget, Computer Shopper's Best Netbook of 2008, PC Pro's Hardware of the Year, PC World's Best Netbook, and DIME magazine's 2008 Trend Award Winner. Eee Pad Transformer, is a tablet computer that runs the Android operating system. Eee Pad Transformer Prime, the successor to the original Transformer. On 6 March 2009, Asus debuted its Eee Box B202, which PCMag saw as "the desktop equivalent of the ASUS EeePC", (the "Asus Eee Box" computer line was later renamed in 2010 to "ASUS EeeBox PC"). Essentio is a line of desktop PCs. As of December 2011[update] the line consisted of the CG Series (designed for gaming), the CM series (for entertainment and home use) and the CS and CP slimline series. Asus sells digital media receivers under the name ASUS O!Play. Asus produces the R700T GPS device, which incorporates Traffic Message Channel. AMD graphics cards were marketed under the Arez brand due to the Nvidia GeForce Partner Program. However, when the GeForce Partner Program was cancelled, the AMD cards were renamed back to the ROG branding. At Computex 2018, Asus unveiled and announced a ROG-branded gaming smartphone to compete against ZTE's nubia Red Magic, Xiaomi's Black Shark and the Razer Phone. The ROG Phone will have a special version of the Snapdragon 845 CPU that can be overclocked, vapor cooling, an external heatsink fan with the USB-C and headphone connectors on its bottom, three different docks and will be released in Q3 2018. Asus released its first sound card, the Xonar DX, in February 2008. The Xonar DX was able to emulate the EAX 5.0 effects through the ASUS GX software while also supporting Open AL and DTS-connect. In July 2008 ASUS launched the Xonar D1, which offered largely similar features to the Xonar DX but connected to the motherboard through the PCI interface instead of the PCI-E x1 connection of the Xonar DX. ASUS then released the Xonar HDAV 1.3, which was the first solution enabling loss-less HD audio bit streaming to AV receivers. In May 2009, Asus launched the Essence ST sound card, targeted at high-end audiophiles, and featuring 124db SNR rating and precision audio clock tuning. In the same month, Asus refreshed the HDAV family by releasing the HDAV 1.3 slim, a card targeted for HTPC users offering similar functionality to HDAV 1.3 but in a smaller form. During Computex 2010, ASUS introduced its Xonar Xense, an audio bundle composed of the Xense sound card and a special edition of the Sennheiser PC350 headset. In August 2010, ASUS released the Xonar DG sound card targeted at budget buyers and offering 5.1 surround sound support, 105db SNR rating, support for Dolby headphone and GX 2.5 support for emulating EAX 5.0 technology. Asus entered the box-PC market with the Vivo PC line in November 2013. ASUS VivoPCs come without a pre-installed Windows operating system. On 23 October 2013 ASUS launched two models of VivoPCs in India. VivoPC was initially announced with Intel Celeron processor equipped VM40B model. But in India, the company released VivoPC along with a new model called VC60 which is equipped by Intel Core series processors. In 2013, Asus released the MB168B, a USB 3.0-powered, portable external monitor. The base model shipped with a resolution of 1366x768, while the MB168B+ had a resolution of 1920x1080. At the time of its release, the MB168B+ was the only 1080p portable monitor. According to Asus, it is the "world's slimmest and lightest USB monitor". In 2000, Asus launched Green ASUS, a company-wide sustainable computing initiative overseen by a steering committee led by Jonney Shih, the Chairman of Asus. According to the company, Asus pursues green policies in "Design, Procurement, Manufacturing, and Marketing." In 2006, Asus obtained IECQ (IEC Quality Assessment System for Electronic Components) HSPM (Hazardous Substance Process Management) certification for its headquarters and for all of its manufacturing sites. In 2007, Oekom Research, an independent research institute specialising in corporate responsibility assessment, recognized Asus as a "highly environmental friendly company" in the "Computers, Peripherals and Office Electronics Industry". In October 2008, Asus received 11 Electronic Product Environmental Assessment Tool (EPEAT) Gold Awards for its products, including four of its N-Series notebooks, namely the N10, N20, N50 and N80. In the following month, it received EU Flower certification for the same N-Series notebooks at an award ceremony held in Prague. In December 2008, Det Norske Veritas conferred the world's first EuP (Energy-using Product) certification for portable notebooks on these machines. In April 2008, Asus launched its "PC Recycling for a Brighter Future" program in collaboration with Intel and with Tsann Kuen Enterprise Co. The program collected more than 1,200 desktop computers, notebooks and CRT/LCD monitors, refurbished them and donated them to 122 elementary and junior high schools, five aboriginal communities and the Tzu Chi Stem Cell Center. In September 2008, PC Pro discovered through a reader that Asus had accidentally shipped laptops that contained cracked and unlicensed software. Both physical machines and recovery CDs contained confidential documents from Microsoft and other organizations, internal Asus documents, and sensitive personal information including CVs. At the time, an Asus spokesperson promised an investigation at "quite a high level", but declined to comment on how the files got on the machines and recovery media. It was demonstrated that an unattended installation of Windows Vista could accidentally copy material from a flash drive with a parameter in the "unattend.xml" file on the personal flash drive being used to script the installation. On 23 February 2016, Asus settled a lawsuit filed by the American Federal Trade Commission. The lawsuit revealed the presence of critical security flaws in the company's home network routers, which put hundreds of thousands of consumers at risk. The insecure "cloud" services led to the compromise of thousands of consumers' connected storage devices, exposing their sensitive personal information on the internet. The breaches took place during the course of Asus' marketing campaign which advertised its routers as including numerous security features that the company claimed could "protect computers from any unauthorized access, hacking, and virus attacks." Settlement agreement required "ASUS to establish and maintain a comprehensive security program subject to independent audits [until year 2036]." In March 2019, Kaspersky Lab researchers disclosed a supply chain attack that affected the Asus Live Update software bundled on its laptops, dubbed ShadowHammer. Kaspersky stated that between June and November 2018, Asus servers had been compromised to distribute a modified version of Live Update, signed with an Asus signature, that contained a backdoor. It deployed a further payload if the device's network adapter matched an entry on an internal target list of around 600 MAC addresses. In response to ShadowHammer, Asus released a patched version of Live Update with improved security measures. Kaspersky and Symantec estimated that between 500,000 and 1 million devices were infected with the backdoor, although Asus attempted to downplay the severity of the breach by noting the extremely targeted nature of the attack. The breach did not affect the similar, identically-named software used to update drivers and the BIOS on systems using its motherboard products. ^ "Jerry Shen Keynote - ASUS NovaGo Launch | Snapdragon Technology Summit". ASUS. 6 December 2017. Retrieved 10 January 2018. ^ "Gartner Says Worldwide PC Shipments Declined 2 Percent in 4Q17 and 2.8 Percent for the Year". www.gartner.com. Retrieved 5 September 2018. ^ "2008 Top Taiwan Global Brands announced today(2008/10/23)". Brandingtaiwan.org. 23 October 2008. Archived from the original on 4 October 2011. Retrieved 1 June 2010. ^ "Russian-language interview with Alexander Kim (Алекс Ким), October 2003". Hw.by. Retrieved 1 June 2010. ^ "Company Profile". Official website. ASUS. 2009. Archived from the original on 22 December 2015. ^ Invisible Gold in Asia: Creating Wealth Through Intellectual Property, page 143, by David Llewelyn. Marshall Cavendish International Asia Pte Ltd. 28 February 2011. Retrieved 22 December 2013. ^ "ASUS Company Information < By Mast Business". publishesiness.com. 3 January 2008. Retrieved 8 December 2015. ^ "ASUS PhysX Card Ready". Vr-zone.com. Retrieved 1 June 2010. ^ "ASUS enters LCD TV market with TLW32001 32" LCD TV". Newlaunches.com. Retrieved 1 June 2010. ^ "ASUS VX1 Lamborghini". PC Mag. 11 August 2006. Retrieved 1 April 2013. ^ John, Walko (9 March 2006). "Microsoft Unfolds Origami, The 'On The Go' PC". InformationWeek. Retrieved 16 November 2009. Microsoft (NSDQ: MSFT) says three companies have built working models – Samsung, ASUS, and Founder, China's second largest PC maker. The Samsung and ASUS devices are expected to be in stores by April, and the Founder device in June. ^ "ASUSTeK and Gigabyte form joint venture". Digitimes.com. Retrieved 1 June 2010. ^ "ASUS BD-ROM/DVD writer drive". 2007. Archived from the original on 13 September 2007. Retrieved 9 September 2007. ^ "ASUS splits into three". PC Pro. 4 January 2008. Retrieved 1 April 2013. ^ "ASUS pins future on small and inexpensive laptop". USA Today. 16 May 2008. Retrieved 1 April 2013. ^ Kubicki, Kristopher (3 January 2008). "New ASUS Corporate Structure Zeroes Employee Pensions". DailyTech. Archived from the original on 10 June 2009. Retrieved 28 March 2009. Under the new corporate entity, ASUS employees were paid out all pension plans regardless of maturity as of 1 January 2008. All employees at the two new companies must start their tenure from scratch. ^ "Open Handset Alliance". Open Handset Alliance. 9 December 2008. Retrieved 1 June 2010. ^ "Asustek to spin off motherboard arm". Financial Times. 11 December 2009. Retrieved 1 April 2018. ^ a b "ASUStek, Garmin ending co-branding". The Taipei Times. 27 October 2010. Retrieved 13 May 2012. ^ "2007 Corporate Sustainability Report Archived 21 May 2009 at the Wayback Machine." ASUS. 10 of 67. Retrieved on 15 March 2010. "ASUS has its headquarters located in No. 15, Li-Te Rd., Beitou, Taipei 11259, Taiwan.". ^ "Asus Story - Profile, CEO, Founder, History | Computer Hardware Electronics Companies | SuccessStory". successstory.com. Retrieved 21 March 2018. ^ Gaurav Dutt (6 June 2015). "Asus will launch three variants of Zenfone 2". All Gadget Buzz. Archived from the original on 7 April 2015. ASUS declared to also launch a cheap variant along with two major versions as they're going to do at Malasyian launch on April 21. ^ Ciaccia, Chris (27 June 2012). "Google Launches Nexus 7 Tablet". The Street.com. Retrieved 15 July 2012. ^ "Google Nexus 7 (2013) specs". Phone Arena. Phone Arena. Retrieved 20 October 2014. ^ "Dell and ASUS debut inspired Windows 8 convertible tablets". Forbes. 18 April 2012. Retrieved 14 June 2013. ^ Latest gadgets from Nokia, ASUS and Samsung. 3 News NZ. 30 September 2013. ^ Buley, Taylor (8 December 2008). "Product of the Year: ASUSTeK's Eee PC". Forbes. Retrieved 1 June 2010. ^ "Stuff Gadget Awards – Eee PC wins gadget of the year". Stuff.tv. Archived from the original on 29 June 2010. Retrieved 1 June 2010. ^ "Taiwan's AsusTek launches Android-powered tablet". 26 March 2011. Retrieved 31 October 2017. ^ Santo Domingo, Joel (2 June 2008). "ASUS Debuts Desktop-Equivalent Eee PC". PCMag. Archived from the original on 24 April 2009. Retrieved 3 April 2009. At the Computex show on Monday in Taipei, Taiwan, ASUS introduced a slew of products, including the Eee Box B202. The Eee Box is the desktop equivalent of the ASUS EeePC. ^ "ASUSTek Computer Inc. – Desktop". ASUS. Archived from the original on 27 November 2011. Retrieved 1 December 2011. ^ "Search > O!Play". ASUSTeK Computer Inc. Retrieved 20 May 2012. ^ Mobilewhack.com on 11 April 2008 3:05 am (11 April 2008). "ASUS R700t TMC GPS Device : Specs, reviews and prices". Mobilewhack.com. Archived from the original on 22 March 2012. Retrieved 1 June 2010. ^ "ASUS confirms AMD Radeon 'AREZ' series of graphics cards". Retrieved 19 April 2018. ^ ASUS, Official Website (28 February 2008). "Crystal Clear Audio Quality for Home Entertainment and Gaming". Retrieved 3 October 2011. ^ ASUS, Official Website (27 July 2008). "ASUS Unveils Xonar D1 7.1 Audio Card: The High-fidelity PCI Variant to the Successful Xonar DX". Retrieved 3 October 2011. ^ ASUS, Official Website (31 December 2008). "ASUS Reveals Xonar HDAV1.3 Series Sound Cards with World's First Dolby TrueHD Bit-Stream Feature for the New Blu-ray Era". Retrieved 3 October 2011. ^ ASUS, Official Website (15 May 2009). "Breaking the Boundaries in Sound Quality". Retrieved 3 October 2011. ^ ASUS, Official Website (18 May 2009). "ASUS Unveils New Xonar HDAV Slim Sound Card". Retrieved 3 October 2011. ^ ASUS, Official Websiteq. "Xonar Xense". Xonar Xense. ASUS. Archived from the original on 30 September 2011. Retrieved 3 October 2011. ^ ASUS, Official Website (June 2010). "ASUS Covers all the Multimedia Bases at Computex 2010". Retrieved 3 October 2011. ^ ASUS, Official Website (August 2010). "ASUS Unveils the Xonar DG Gaming Sound Card". Retrieved 3 October 2011. ^ ASUS, Official Website. "Xonar DG Hear all, dominate all!". Xonar DG Hear all, dominate all!. ASUS. Retrieved 3 October 2011. ^ "ASUS launches VivoPC mini desktop in India – starts at Rs. 20,550". Evyush.in. 23 October 2013. Archived from the original on 23 February 2017. Retrieved 23 February 2017. ^ Byford, Sam (10 August 2018). "Editor's Choice: Asus ROG Swift PG279Q gaming monitor". The Verge. Retrieved 7 October 2018. ^ "ROG SWIFT PG35VQ". ASUS Global. Retrieved 17 January 2018. ^ "Green ASUS". Green ASUS. Retrieved 1 June 2010. ^ "ASUS Conferred World's First EuP Certification for Portable Notebooks for Its N Series Notebooks". ASUS. 2008. Archived from the original on 20 February 2009. Retrieved 28 March 2009. Green ASUS – which was initiated in 2000, pursues the "Four Green Home Runs" in the design and production of notebooks, namely: Design, Procurement, Manufacturing, and Service and Marketing. ^ "GreenASUS Management System". Official website. ASUSTeK Computer Inc. 2009. Archived from the original on 3 August 2008. Retrieved 27 November 2009. ^ a b c "GreenASUS News and Awards". Official website. ASUSTeK Computer Inc. 2009. Archived from the original on 3 August 2008. Retrieved 27 November 2009. ^ "ASUS, Intel Team up for PC Recycling in Taiwan". Pcworld.about.com. 22 April 2008. Archived from the original on 15 August 2011. Retrieved 1 June 2010. ^ "ASUS Recycle". Asus. Archived from the original on 6 August 2010. Retrieved 1 June 2010. ^ Collins, Barry (17 September 2008). "ASUS ships software cracker on recovery DVD". PC Pro. Dennis Publishing. Archived from the original on 27 June 2009. Retrieved 21 June 2009. The startling discovery was made by a PC Pro reader whose antivirus software was triggered by a key cracker for the WinRAR compression software, which was located on the recovery DVD for his ASUS laptop. ^ "News: ASUS ships software cracker on recovery DVD". PC Pro. 17 September 2008. Retrieved 1 June 2010. ^ Cargile, Anthony (20 September 2008). "ASUS Recovery DVD scandal: How it happened". The Coffee Desk. Archived from the original on 8 January 2011. Retrieved 18 February 2011. ^ Lord, Timothy (22 September 2008). "How ASUS Recovery Disks Ended Up Carrying Software Cracks". Slashdot. Geeknet, Inc. Retrieved 18 February 2011. ^ "ASUS Settles FTC Charges That Insecure Home Routers and "Cloud" Services Put Consumers' Privacy At Risk". Federal Trade Commission. 23 February 2016. Retrieved 16 January 2017. ^ Lilly, Paul (26 March 2019). "Asus downplays reach of Live Update hack, issues a fix in latest version". PC Gamer. Retrieved 26 March 2019. ^ "Asus Live Update Pushed Malware to 1 Million PCs". ExtremeTech. Retrieved 26 March 2019. ^ Cimpanu, Catalin. "ASUS releases fix for Live Update tool abused in ShadowHammer attack". ZDNet. Retrieved 26 March 2019. 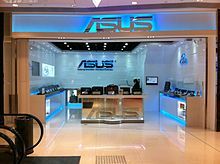 Wikimedia Commons has media related to ASUS.